Aluminum Foil Pans are a necessity for any restaurant. Some restaurants use them for roasting while others, like buffets and catering lines, use them for aluminum trays to serve food in. Most bakeries use aluminum foil pie pans and aluminum cake pans to bake their pastries. Many fine dining restaurants use the round foil pans and lids for takeout and to-go orders. Foil pans can also be used as disposable steam table pans. All in all, the best advantage of aluminum foil pans is the fact that you can use them and throw them away in one sitting. 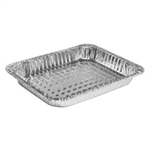 Handi Foil Loaf Pan Container - 1 Lb. Aluminum Round Container with Lid - 8 in. Round Aluminum Pan - 10 in. Aluminum Round Pan - 7 in. These aluminum foil pans are considered economical and, at the same time, very effective when cooking a wide variety of foods. Due to their heavy duty durability and disposability, it is easy to recognize why professional chefs consider them as a favorite kitchenware. As a restaurant supply distributor, we understand how important this item is and we do our best to sustain inventory, having aluminum foil pans in stock and ready for shipment for our everyday customers. Take your time and browse through our list of following aluminum products. Purchase your aluminum foil pans from a trusted leader in restaurant supply. Avoid dishwashing and be more time efficient at your restaurant by using aluminum foil pans for your every restaurant needs. Aluminum pans can also be used for other purposes, such as holding paint, holding craft supplies, and catching drippings under your outdoor grill.